One of New England’s finest guitarists, David Surette has been quietly generating a growing following for his work as a soloist. His solo albums “Back Roads” and “Trip to Kemper” have helped to establish him as a top player and arranger of Celtic fingerstyle guitar, yet his diverse repertoire also includes original compositions, blues and ragtime, traditional American roots music, and folk music from a variety of traditions, all played with finesse, taste, and virtuosity. 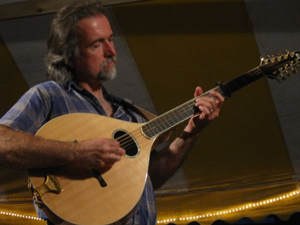 He is equally at home on the mandolin and bouzouki, and is well-known as a top-notch accompanist in New England’s contra dance and Celtic music circles, and is also in demand as a studio musician and sideman.